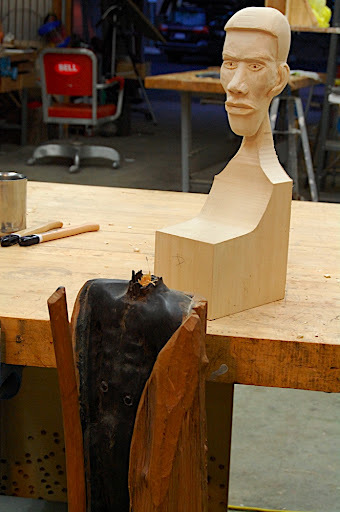 Once the dowel was made and the holes were formed, I whittled down the neck base so it will fit better into the "V" shape socket on the sculpture. I marked the surplus wood black and cut it out with a gouge. Next, I put glue in the holes and on the dowels, and pressed the parts together. 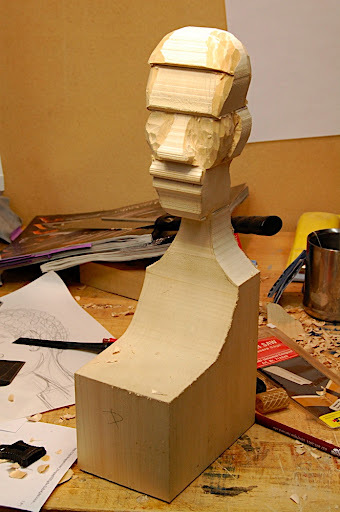 Lastly I shaped the neck to nicely integrate it with the shoulder area. Next time I will show how I finished the piece using milk paint. 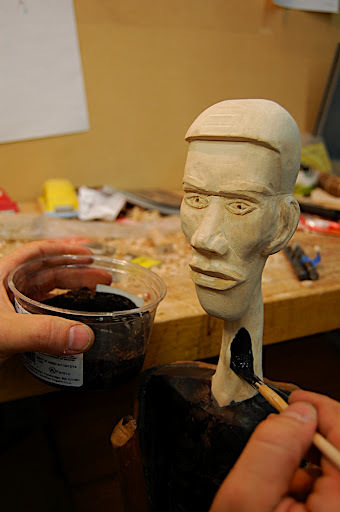 After I finished carving the head I turned to do the more accurate task of shaping and installing the neck to the body. Firstly I cut the neck base to in the shape of a "V"; this way the transition seam will look less conspicuous than if I had cut if flat, plus, a "V" shape will anchor the neck in a stronger way. 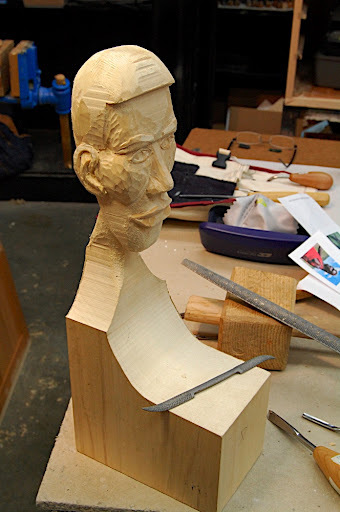 Secondly I cut a complementary "V" shape recess on the neck base – between the shoulders. 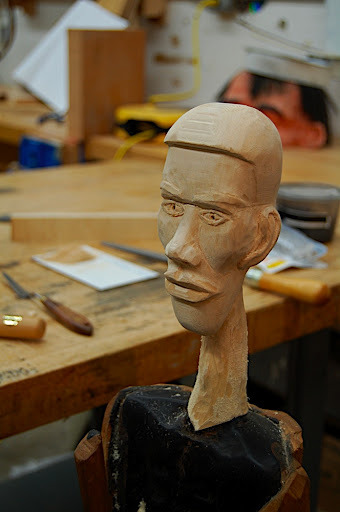 After this I turned a step dowel on the lathe to serve as a connecting agent between the neck and the body. In situations like these, when you need to drill matching holes in two separate parts and make sure that the holes are in prefect alignment, I do the following: I tap a small brad into one of the parts. With a cut nippers I decapitate the head of the brad to about 1/8" abouve the sarfae. Than I take the other part and set the two together, pressing down on the cut brad. Now I separate the parts and extract the brad. The two remaining puncture holes serve as locus for drilling the holes where the dowel parts will sit in. 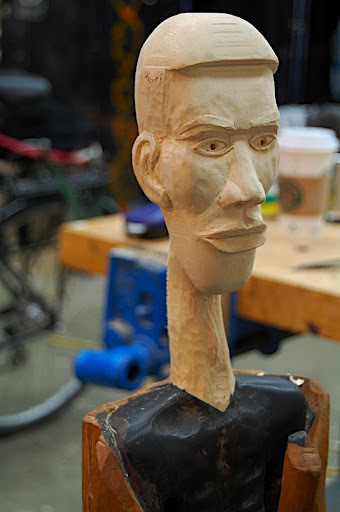 I made a step-dowel that is narrower in the neck and wider when it is installed in the body of the sculpture. As I started going deeper and deeper into details, I realized that for some details a reference source is really necessary. 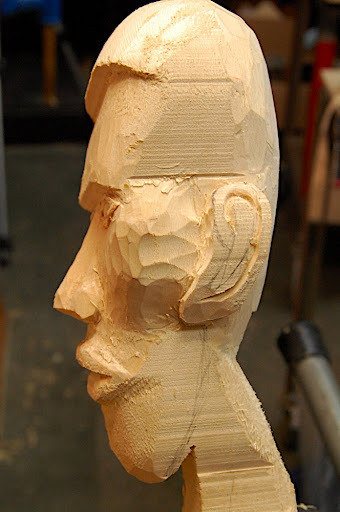 Carving the ears was such a case where I new I needed detailed images of ears, a book or a real life model. 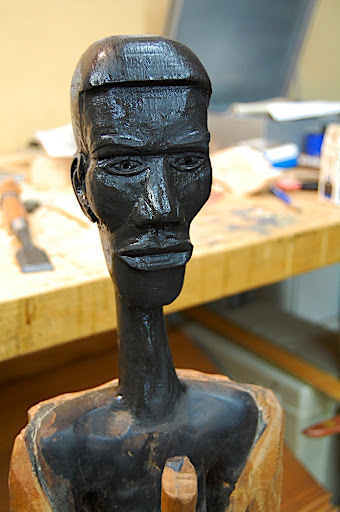 One of our students, Trent – who is a brilliant sculptor, have books on human anatomy. 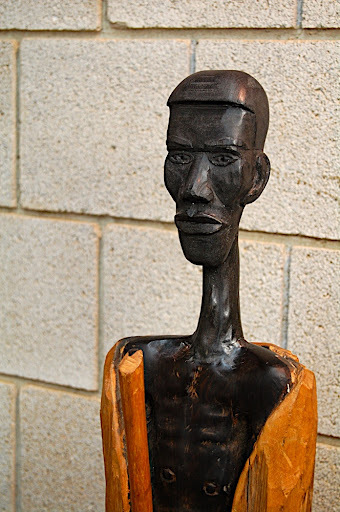 The books contains photographs of clay sculptures: Heads, busts and facial features. This book also explain who to form sculptures in a very good way. Though the medium discussed in the book is clay, the principles layout and displayed there could surly benefit woodcarvers and wood sculptors. 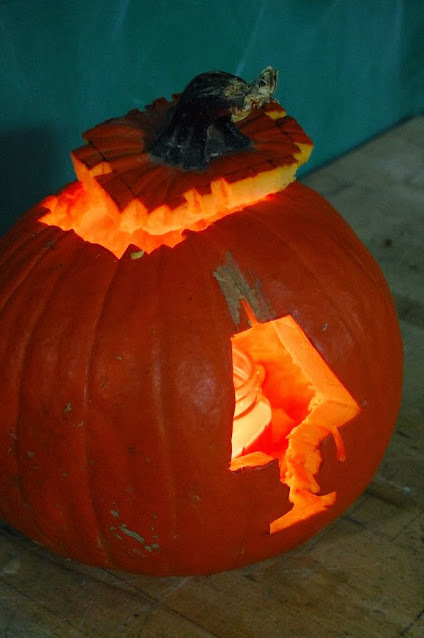 For carving the ears I used the second book. 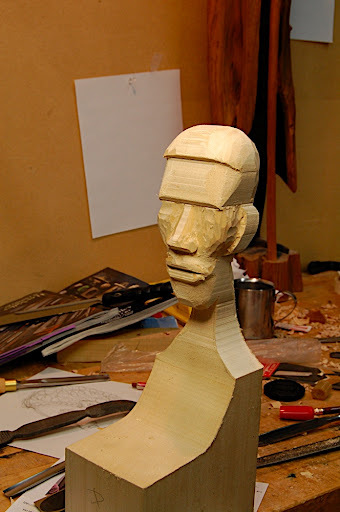 After shaping the head with the band-saw, I started to work the facial details with flat chisels and gouges. Basswood is a fantastic wood for carving: It is soft, homogeneous, and don't have a tendency to tearout. 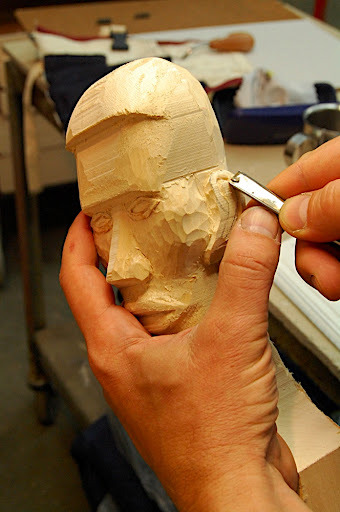 Choosing the right gouge for the job, deciding on the specific technique to reduced a block of wood into a 3D sculpture or decoration, is a very personal approach. I like to do the rough carving with a No 7 or No 5 gouge. 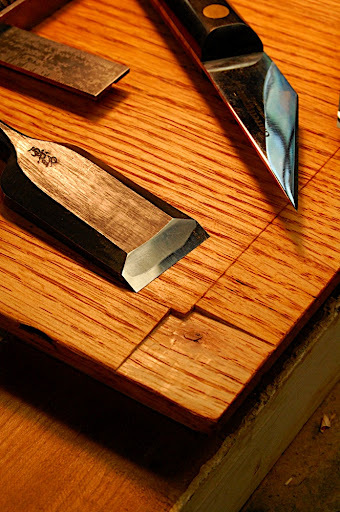 I also like to use fishtail gouges (No 3, and 5). 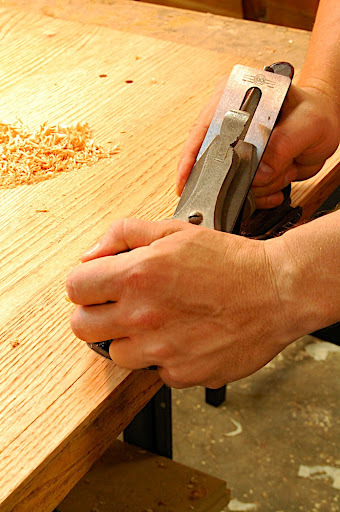 Occasionally I will reach-out for a carving knife in order to cut defined lines between two surfaces, or to work in areas where the gouge is just to cumbersome to handle. 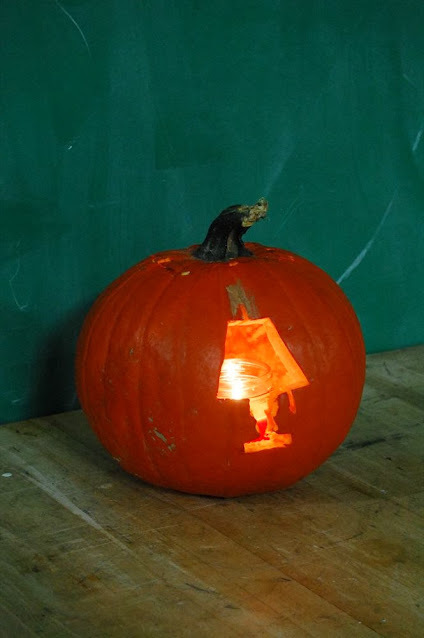 In this picture I start carving with a flat chisel. I chamfer the corners and reduce the block. Gradually I started to shape the mouth. 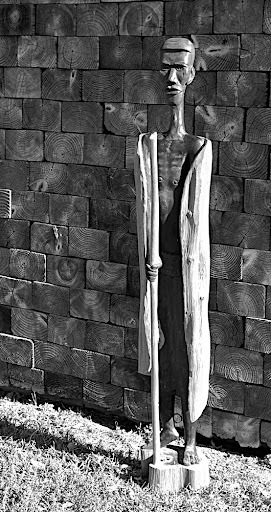 Next time I will describe the process of going into carving details. 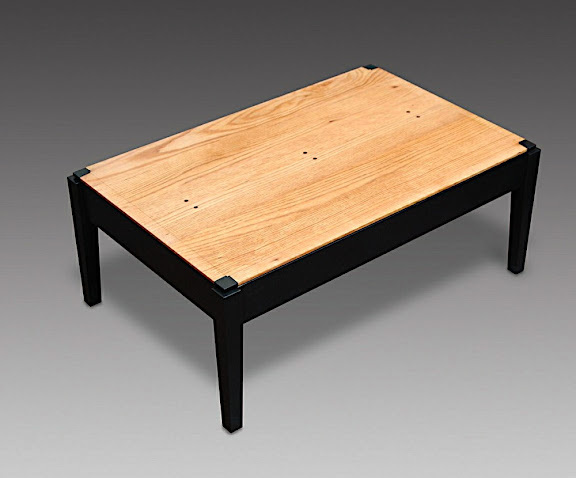 The last part in the coffee table project, was to add a corner detail to emphasize – even farther – the presence of the slanted chamfer. I decided to create an indented square at each corner which will expose the chamfer's angle and thus will make it more conspicuous. 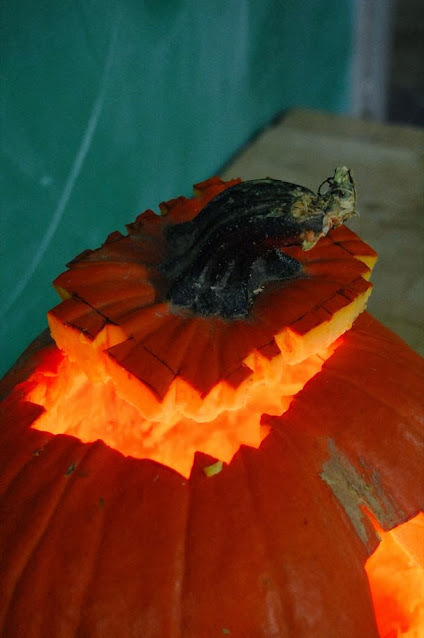 I used a chisel and made the indentation. 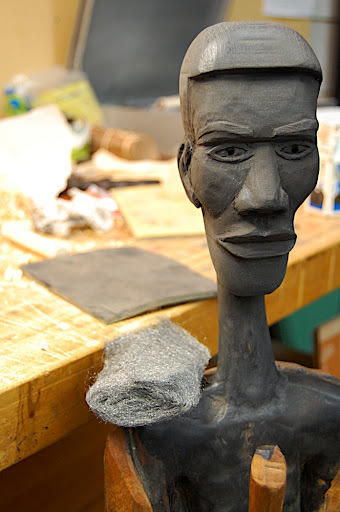 I then painted the square black-gray (the same color as the table base. One might mistake the black-gray square as the top of the leg, but of course this is just an illusion. After the glue, which secure the dowels dried, I planed the dowel and its surrounding surfaces flush. 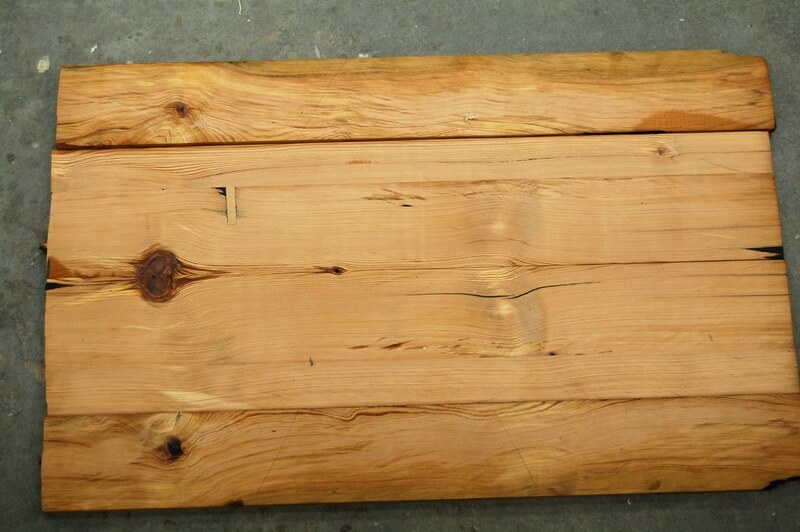 Then I started to rabbet the boards edges to allow them to fit in into the table frame. 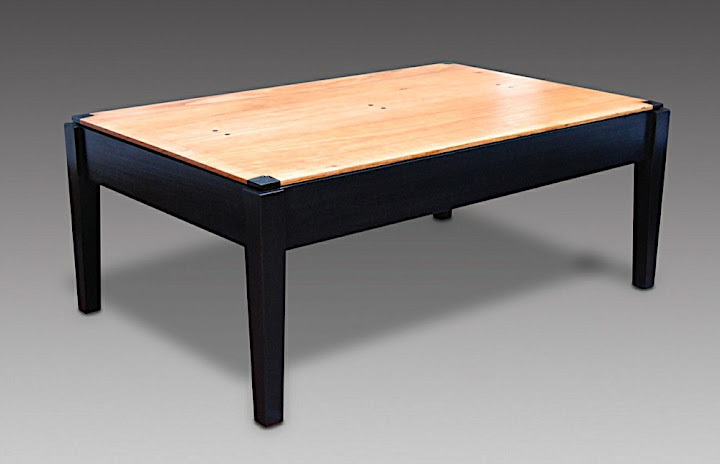 I did not want to connect the board to the frame with fasteners; it was not necessary, as I created an internal rabbet (or lip) on all the table apron/rails which will accept the rabbet on the table top. Someone (It probably happen when I took a brake form work and ran to have a brownie and tea) evidently knocked my piece down and a chip of wood broke-of of it. It was a pity but actually not such a bad one. As it happen often: mistakes and accidents can lead to discoveries. In this case, and instead of trying to embark on a restoration mission (fitting a replacement piece of oak and then planing it down) I decided to change the design a bit. I went on to create a slanted chamfer on all edges. I planed the chamfer until the missing wood chip blended in the angled strip. Before starting to plane the chamfer I scored its parameters. I did it for two reasons: to help me know when to stop planing; and to create a defined transition line between the chamfer and the table top. You see, it would be very difficult to recognize a chamfer of such a subtle slanting angel – as an intended design feature – without the border line. When it is difficult to pinpoint a transition between structures or materials, people tend not to notice it.... or worth: think that the maker made a mistake or neglected to think the design through.